Earning on Freelancer.com isn't limited to bidding on projects. You can also get hired directly, provide a service, or join contests! Contests are perfect for freelancers who want to showcase their work and are excited by competition. Winning means you earn money, build your reputation, and get the chance for more work, all while learning more about your skills. Of course, anyone* can! And it's free. *Anyone who is a registered freelancer on our site, has the drive to improve and win, and completes the verification requirements. Find the contests that interest you by reading through the descriptions in the browse jobs page: Contests come in a wide range of categories, with a majority being design-related. However, there are also a large number of video, writing, and programming contests that are also regularly open. Understand what the contest holder wants: If you feel that there are important details left out of the description, ask a question on the Public Clarification Board that is found in a contest's view page. Do your research. Observe the entries that get 5 star ratings, and read through the contest holder's comments. Once you have an idea that fits the contest holder’s needs, craft your entry. Showcase your skills and creativity! Just make sure that it's an acceptable file type. What happens after I submit my entry? Your participation in the contest doesn't end after submitting that first entry. Contest holders can rate your work and give feedback. Take this chance to improve your work and get closer to winning. If you have several ideas for a contest, make sure you submit all of them. This includes changes in color and the arrangement of elements, as they can make all the difference in showing the contest holder what they want. And then there's waiting. While waiting for the result of a contest, your time is best used finding and joining more contests that interest you. That will just increase your chances of winning even further! So when do I win? You win when the contest holder awards your entry. They also have the option of buying your entry, in which case you'll get paid at the price you sell it for. You will be notified on Freelancer.com and on email when either of these happens, then you will be prompted to proceed with the handover process. You will not win every contest. This is simply part of the competition, after all. However, if you sharpen your skills with each entry your work on, you never lose. I’m new to Freelancer. Can I still participate? Yes, as long as you meet the criteria* above. Contests are the best way for freelancers with no ratings on the platform to showcase their skills and build their reputation. If you're an experienced freelancer, this is your chance to work on a wide range of jobs from around the world. Impressed contest holders might even offer you more work in the future. If you're a new freelancer, invest more time in upgrading your skills and crafting the perfect entries. We want to make sure your effort goes into entries that have a good chance at winning. You can find resources for learning on our community blog. Aspiring designers can get ahead with these tutorials and tips. TL;DR. What do I really need to know? Copying other freelancer's work is strictly forbidden. Borrowing images taken from the internet is discouraged, unless otherwise specified by the contest holder. All entries submitted must follow the contest brief. Placeholder entries are not allowed -- you can let the contest holder know that you plan to participate in the contest instead. You can't own a generic design, and thus can't be paid for one. Take this chance to show off your creativity. If you catch someone violating the rules, report them or tell them politely. Abusive language is not tolerated on the platform. 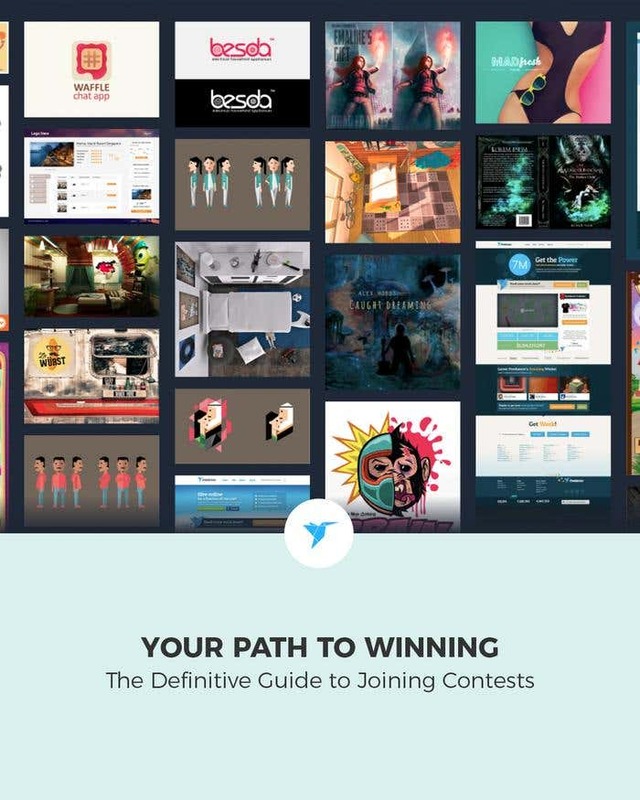 We hope this guide is the kickstart you need to join contests. As long as you continue to improve and play fair, contests are a great way to earn while you learn. Impressed contest holders and a good reputation will also lead to more work on Freelancer. I do data science plus everything in between at Freelancer.